Greetings from this end. We thank you for all your prayers for the safe travel of our visiting lecturers brother Josh and later brother David Ballard. Their presence in our midst this day is an answer of many prayers. The week was a busy one for the lecturer and the students of CBIW as they were busy with the short course Advance Hermeneutics. All the other activities which are part of the program of the school and our congregation went on well. We praise God for all He is doing to accomplished His will here. Brother Josh Austin from Bear Valley gave his final in the Advance Hermeneutics course. He said all went well, so this week he will be busy grading the papers while brother David Ballard will start teaching the book of Romans tomorrow through Friday. 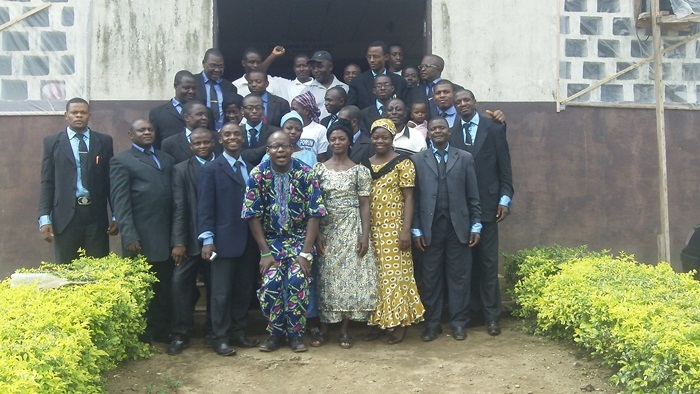 Keep them in your prayers for good health until they leave Cameroon. 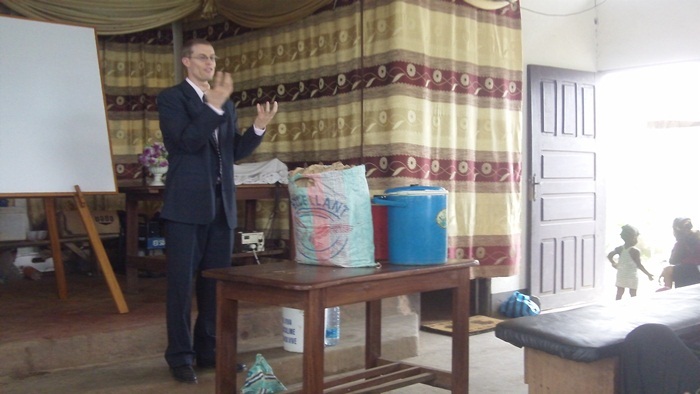 Brother David Ballard taught Bible class this morning in Wotutu congregation after a long flight from the USA. It was great as he taught the congregation on the topic “Get dressed for heaven.” It was great in the midst of 3 visitors. They benefited from it on how to put on Christ. Today was also a great day in Wotutu as the Christians celebrated 6 years of existence as the congregation of Wotutu was established on the 4th of June 2006 after I graduated from NCI school of preaching in Nigeria. From 4 persons that worshipped that day today 118 persons have been drawn very close to the gospel as the years are passing by. Keep this work in your prayers as we continue to think souls, continuing to rob from the strong man’s house so that we shall continue to depopulate hell and to make heaven populated. Today was a day of activities, as we just finished our fellowship. 6 brethren from the Mile 14 Dibanda congregation came to Wotutu with food and bread to visit with the students of CBIW for the great work the students did in their congregation. Brother Josh Austin stood up in the capacity of the coordinator to appreciate the small struggling congregation who are less than 20 in number for such a great love shown to the school. Keep the work in your prayers so that many will love to come and give encouragement to these men who have forgone many things to study the Bible. The family met outside the church hall for memories for good gestures like this. Keep this young congregation in your prayers. Praise God for providing us with good food after serving during the day. 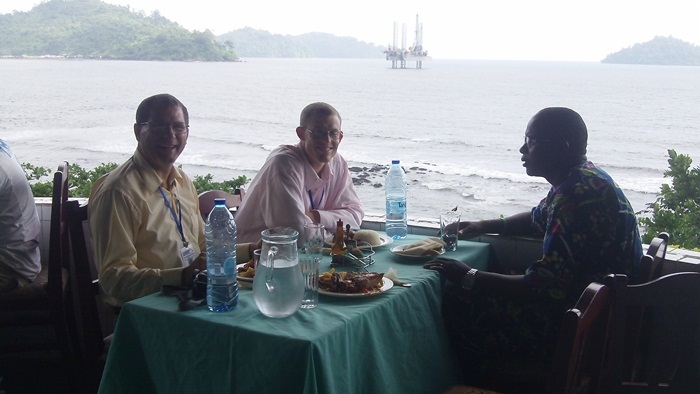 We took lunch in a beautiful sea side hot spot restaurant in Limbe. During our fellowship meal today, brother David Ballard was also busy with the children of our congregation making them laugh. He sat on the floor to do all that. It is great and we are blessed with the fine men that God is sending to serve here. May God bless them as they continue to enjoy their stay here. 1) This Friday and Saturday respectively, our students will travel to 17 different congregations. Among those congregations one will be a virgin land to help in a particular locality to establish a congregation in Makobe village. Keep the plan in your prayers. 2) Our plans for establishing a new congregation in Ebonimi will surely work out well in the first week of July when the students come back from vacation. 3) We have finalized a nurturing trip to Muyuka congregation in July when the students return. That congregation came to our campus to make an appeal to come over to our place and help. We praise God for using you and us to accomplish His purpose here in our area. Evangelism remains our priority because we have known Christ so we use all we have to make Him known to many. Thank you for your prayers and support, it is working well. Do your best to share this report with others who may love to be part of this soul saving team. God bless and watch over you and your family. Posted on June 10, 2012 by Bob Turner and tagged Cameroon.